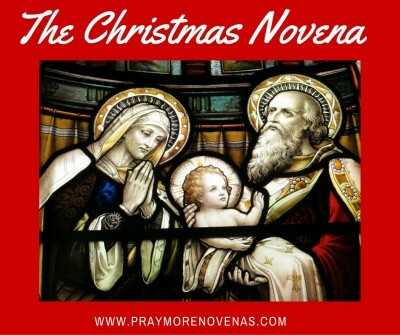 Here’s Day 8 of the Christmas Novena! Dear God, Jesus and Mary, our holy mother, please forgive all our sins, and please help my daughter in law who is being induced today, to have a healthy, healthy and more healthy baby. Please watch over her and give her strength to deliver this amazing baby, who will be born two weeks premature. Please hear my prayers and bless my son and his wife with this amazing miracle of life. Thank you, your loving servant forever. That my two sons and their girlfriends and children find Jesus and the Catholic Church. That I continue my journey in the diaconate program to become a deacon. Most Blessed Mother of God, Jesus, Joseph and all the Angles and Saints hear my prayers. Please help me to be more forgiving towards my husband, become more patient and bring all matters to you blessed Mother Mary & God’s heavenly host for Divine intercessions. Forgiveness for reacting towards my husband’s idle words. I pray for FC to become more understanding towards me his Christmas. Please bless my friends and family this Christmas and especially my parents & may their souls rest in peace. Amen ???? In thanksgiving for a perfect medical report. I will serve the Lord His plan for my life with a healthy body. Thanks to God for my doctors, techs, researchers, all medical people God has aloud to prosper against disease. Pray that my husband, Matt, will be enlightened, awakened, and reconcile his addiction through your intercession infant Jesus and immaculate Mary. Draw him closer to your heart. Intercede St. Joseph and draw him close to you to guide him in your ways as father of the holy family. Pray for my children and there safety while driving long distance during the holidays. Loving God, I pray for all those who have decided abortion as their choice and not Your Will. I pray, that my son Daniel, who was infertility, is blessed with humility, and love in our relationship. Please hear my prayers, we struggle to get along, since his father & I are divorced 10 years. Please pray for him, and Your Will God to bring us peace in our day. My heart aches, please hear my prayers. Wishing everyone a Merry Christmas. Have a nice time with family and friends. Take time to go to Mass and enjoy the Christmas Carols. Lord please help me pass all of my grades and graduate this april 2017. Please heal the relationship of mommy and nanay and heal daddy. Protect also kuya ian and ate bevon keep them safe all the time. PLEASE Holy Mother give me the grace to accept my husband’s problems and help me over this coming Christmas to deal with them calmly. Bless all my family that they may have good health. Amen. Please help us on our coming board exam for Architecture this january 27 and 29. May we pass the architecture licensure examination.